How do I re-sync a replica member in replica set? How can I recover MongoDB after a crash? When should I use MongoDB's GridFS specification to store and retrieve files? How do I fix corrupted data? This blog post shares a few tips for handling these situations when you're using MongoDB. If your database crashes and you're not running with the –journal flag, don't use that server’s data. MongoDB's repair command goes through every document it can find and makes a clean copy of it. However, keep in mind that this process is time-consuming, uses a lot of disk space (the same amount of space that's currently being used), and skips any corrupted records. Because MongoDB’s replication process can't fix corrupted data, you'll need to be sure to wipe the possibly-corrupt data before re-syncing. To resync a member of a replica set, ensure that at least one secondary member and one primary member are up and running. Then, ensure that you're logged in as the user named Oracle and stop the MongoDB service. Log in as the user named MongoDB and move all of the data files in the backup folder so that you can restore them if you run into a problem. If the old files are present in the backup folder, you can remove them. If you're not sure where to find the data files, take a look in /etc/mongod.conf. As the user named Oracle, start the MongoDB service. Log in to the database to validate. You don't need to authenticate in order to access the database until the member is synced in the replica set. After the replication process is complete, the status will change from STARTUP2 to SECONDARY. MongoDB uses the GridFS specification to store and retrieve large files. In essence, GridFS breaks up large binary objects before storing them in a database. GridFS requires two queries: one to fetch a file’s metadata and one to fetch its contents. Therefore, if you use GridFS to store small files, you're doubling the number of queries that your application has to perform. 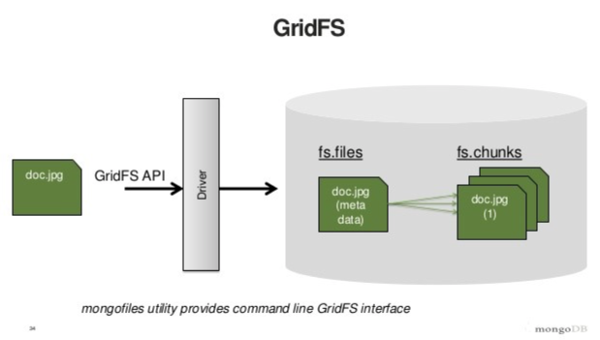 GridFS is designed to store big data, meaning data that's too large to fit inside a single document. As a rule of thumb, anything that's too big to load in a client probably isn't something that you want to load all at once onto a server. The alternative is streaming. Anything you plan to stream to a client is a good candidate for GridFS. Developers know that accessing data from RAM is fast and accessing data from a disk is slow. While you might be aware that minimizing the number of disk accesses is a great optimization technique, you might not know how to accomplish this task. One way is to use a solid-state drive (SSD). SSDs perform many tasks much faster than traditional hard disk drives (HDDs) do. They also work very well with MongoDB. On the other hand, they're often smaller and more expensive. The following image compares SSDs and HDDs. The other way to reduce the number of disk accesses is to add more RAM. However, this approach will only take you so far, because eventually your RAM won't be able to accommodate the size of your data. The question is, how do we store terabytes or petabytes of data on disk, program an application that will mostly access frequently-requested data in memory, and move data from disk to memory as infrequently as possible? If you access all of your data randomly in real time, the answer is that you'll need a lot of RAM. However, most applications don’t work this way. Recent data is accessed more often than older data, certain users are more active than others, and certain regions have more customers than others. Applications that fit this description can be designed to keep certain documents in memory and access disk very infrequently. If you run journaling and your system crashes in a recoverable way, you can restart the database normally. Ensure that you’re using all of your normal options, especially -- dbpath (so it can find the journal files) and --journal. MongoDB will fix your data automatically before it begins to accept connections. This process can take a few minutes for large data sets, but much less time than it typically takes to run repairs on large data sets. Journal files are stored in the journal directory. Do not delete these files. The repair command essentially performs a mongodump and then a mongorestore, making a clean copy of your data. In the process, it also removes any empty “holes” in your data files. The repair command blocks operation and requires twice the disk space that your database is current running. However, if you have another machine, you can perform the same process manually by using mongodump and mongorestore. Make a copy of the data file in Hyd1, so that you still have it as a backup. Then, delete the original data file and restart Hyd1 with empty data. These changes have boosted our MongoDB performance significantly. If you're planning to use MongoDB, you might want to bookmark this article, then come back to it and check off each tip the next time you start a new project. In Part 2 of this two-part series, we'll share some tips that help large enterprises properly design, optimize, and implement useful MongoDB features.